To date we have visited schools in every county nationwide. Schools are very open and welcoming and continue the monthly COTE programme with the help of parents or parishioners or the priests themselves. We have also visited secondary schools and the students have found their time in prayer most enjoyable. In April 2016, we were invited to run the COTE programme, as part of a family week retreat at the Craig Lodge Family House of Prayer, in Scotland. We led the children and their families in adoration of the Blessed Sacrament each day of the 5-day retreat. The COTE programme was received very well by children and parents alike. A number of the parents returned to their homes and parishes and asked their priests and principals if the COTE programme could be initiated in their schools. The following November, we piloted COTE in 5 schools around Glasgow City. Local volunteer leaders have continued the adoration with the school children each month since then. In February 2017, we initiated the COTE programme in a Catholic Primary School in Chesterfield, in England, following the invitation of a priest who heard about COTE after a visit to Craig Lodge. Over the course of a week, we introduced all of the primary school students in P4 Class and over, to Eucharistic Adoration. The response from staff and students at the school was more than we could have hoped for. 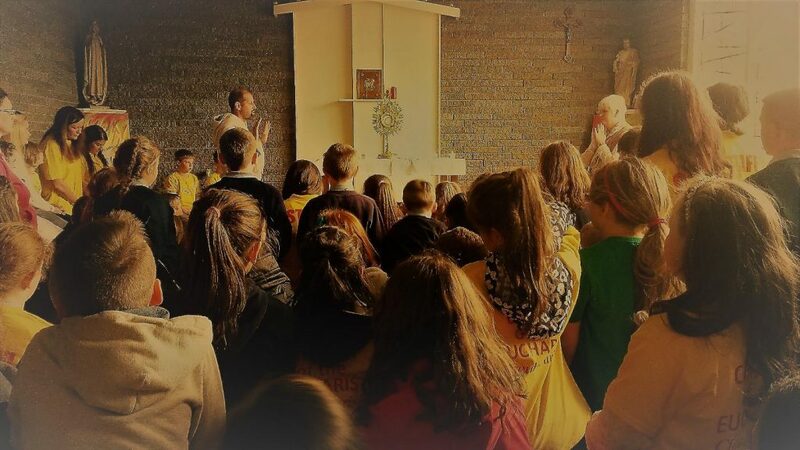 With over 25,000 children and teens now experiencing Eucharistic Adoration, we hope to see the mission continue and grow with your interest and support and indeed your call to partake in this Ministry. We hope you might consider this wonderful way of prayer for the youth of your diocese. Please keep this work in your prayers and pray that many young people, our future generation, will encounter Jesus in the Blessed Sacrament. With the volunteer leaders’ continuous support each month, we see the development of the children’s relationship with Jesus. The children eagerly look forward to their next visit with great anticipation and excitement. In accordance with the ‘Children of the Eucharist’ guidelines, it’s vital that we remain obedient to the format and structure which was inspired by the Holy Spirit.